On November 9, the Air Quality Index for Ghaziabad was 499 on a scale of 500, Delhi had a reading of 486. On the other days that Ghaziabad topped, the values were over 450. Ghaziabad touched record pollution levels - way above Delhi - six times over the last 12 days. Lucknow: The weeklong smog blanket over Delhi has been in media spotlight but it is neighbouring Uttar Pradesh hat has the worse air quality. Over the last three days, cities like Ghaziabad, Noida, Lucknow, Kanpur and Varanasi have turned the bigger gas chambers. Today, the National Green Tribunal lashed out at the UP government and the Noida Authority for flouting its ban on construction in the national capital region, despite PM10 level being over 900. The court said they were making a "mockery of the system." "You have no respect for human rights. This is disgusting. PM10 is over 900. You are bound by our order as you are a part of Delhi-NCR. 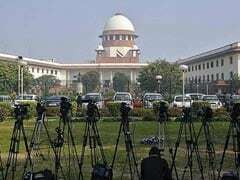 You are making a mockery of the system," said a Green court bench headed by Swatanter Kumar, that was hearing a petition that said despite the court's orders, construction material was left lying in the open. According to data from the Central Pollution Control Board, Ghaziabad touched record pollution levels - way above Delhi - six times over the last 12 days. On November 9, the Air Quality Index for Ghaziabad was 499 on a scale of 500, Delhi had a reading of 486. On the other days that Ghaziabad topped, the values were over 450. The city, adjoining Delhi, is India's most critically polluted Industrial cluster, said a report by the ENVIS Centre on Control of Pollution Water, Air and Noise under the Environment ministry, dated June 2016. This year, Ghaziabad had "Poor" levels of lethal Particulate Matter 2.5 once every three days -- above 91 micro grams per cubic metre. The toxic level read "Severe" on 48 days. Varanasi, a tourism hotspot and the Lok Sabha constitution of Prime Minister Narendra Modi, was India's most polluted city on Friday, according to data from Central Pollution Control Board. This year, the city's level of the critical pollutant PM 2.5 was severe in one of every four days. In Agra, the level of PM 2.5 was "severe" one in every three days of this year. One of India's biggest states with a population of over 20 crores, Uttar Pradesh has just 11 monitoring stations that record continuous air quality. In contrast, Delhi, whose population is less than 2 crores, has 23 stations. Uttar Pradesh has cut down environment department budget meant for "Solutions to air and water pollution" by a whopping 90 per cent. Last year's budget was Rs 4.5 crore, this year, it is 50 lakh. The decline in allocation had started during the previous Samajwadi Party government led by Akhilesh Yadav. Between 2015-16 and 2016-17, the budget cuts for environment amounted to nearly Rs 1 crore. Chief Minister Yogi Adityanath has appealed to farmers not to burn crop residue - one of the key causes of pollution. "We are going to start a process that whatever crop residue is left in fields, we will use it to make bio-diesel. Till that happens, turn it into compost," he said. The BJP manifesto in the state for the 2017 assembly elections said little on how it plans to improve air quality. On March 30, state agriculture minister Surya Pratap Shahi said they were considering "a blanket ban on stubble burning across the state".